It is no secret that tadpole trikes are hard on tires … especially if you enjoy their handling characteristics they are capable of. Fast cornering does “scrub off” rubber. I just changed my right front tire after nearly 2 years of service on the Schwalbe Marathon Plus tire. Over that nearly two years I racked up 7655 miles. You just can’t beat those Marathon Plus tires! I am sold on them. That is phenomenal mileage. I did good to get 2000 miles out of any other tires I tried. And the additional bonus is I have never had a flat tire the entire time I have been using the Marathon Plus tires. 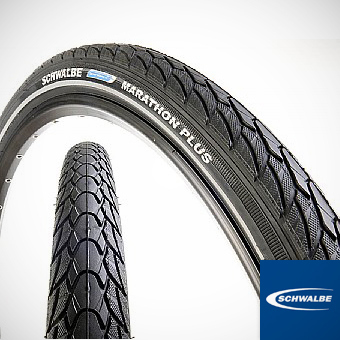 I just ordered 3 new Marathon Plus tires from Germany at $37.42 apiece (including shipping). It it the lowest cost source I have found for these tires and their service is excellent. I have only ordered from them once previously so I don’t have a whole lot of personal experience with them, but I was very impressed with that first order. If I appear to be “pushing” Marathon Plus tires that is because I am. To put it bluntly I don’t understand why anyone who rides a tadpole trike would even consider using any other tire on their trike. I have tried most of the other Schwalbe tires and there is just no comparison. If you like getting flats and inferior mileage the others are fine. I would much prefer to ride than deal with flat tires and low mileage as far as tire wear goes. You are just throwing money away using any other tire. I know that there are those that would not consider using the Marathon Plus tires as they claim that they slow them down a half mile an hour. Big deal! That is like the tortoise and the hare. Those of us running Marathon Plus tires will pass you by when you are broke down changing a flat tire. But hey, to each his own! 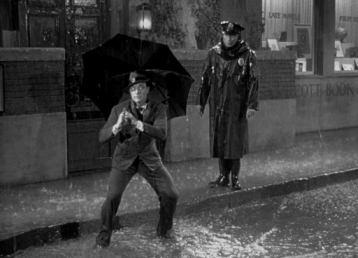 Some folks talk (or sing) about singing and dancing in the rain, but I’m here to talk about riding in the rain. That is not always something that is easy to sing about or during. 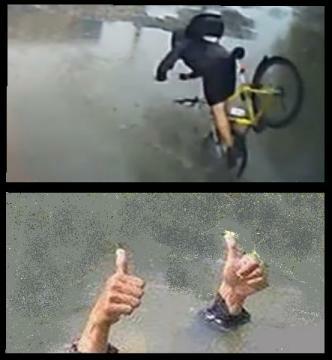 Personally I don’t care to get caught out riding in the rain. Oh, it can be refreshing sure enough if it is a hot day. Still getting wet isn’t my idea of an enjoyable ride. I especially don’t like getting my footwear wet and having to get it dried out before the next day when I want to ride again. The same is true of my trike’s seat and headrest. Most of my riding is on trails so I don’t have to deal with all that much cars, trucks, buses, etc. Riding in the rain on streets and roads presents a extra concern as visibility is greatly reduced making for considerable danger for the cyclist. If I happen to be riding out on one of our local trails falling rain oftentimes makes for a muddy mess on parts of the trail. That definitely isn’t any fun riding thru mud. And the mud I am talking about is nasty mud as it is silt deposited from the rivers when they flood. It has dried up on the trails but when it gets wet again … yuucccckkkkkk! It is nasty smelly stuff. And it sure makes a big mess of my trike and is very difficult to clean off. Another thing that seems to happen when trying to ride in the rain the rain water gets into my eyes and makes for a miserable time. Nope, I usually try to find shelter when it is raining and hope it passes by and I can continue on without dealing with it. I try to watch the weather forecast and weather radar to avoid dealing with it as much as I can. Sometimes though I simply get caught out in it despite my attempts to avoid it. I guess I really am not into singing and riding in the rain after all. How about you? Do you ride in the rain and manage to sing along during it? Please feel free to comment. 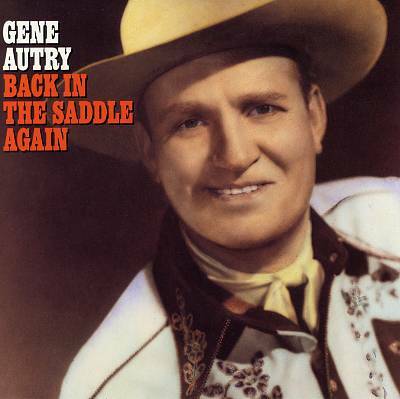 Those who are old enough will probably remember the singing cowboy, Gene Autry, singing a song he made famous. It was his theme song. It came to mind as after not being able to ride my tadpole trike for nearly 3 weeks I took my first ride yesterday afternoon and my second ride today. It sure is good to be back riding after so much time sitting around the house not allowed to do much of anything while recovering from glaucoma surgery on my eye. I rode about 21.5 miles today … not bad for a hot summer day and some hill climbing involved. One thing I have noticed as has a friend of mine who rides a tadpole trike … we can interrupt our riding for weeks and get right back on our trikes and ride like we never had stopped riding. We could not make that claim when we both rode bicycles. I am curious to know if anyone else agrees with this. Feel free to comment. Now ya gotta admit sitting in the chair shown above looks like it would be a whole lot more comfortable than sitting on the diamond frame bicyle seat shown below. Personally I am not a fan of being in discomfort. And it makes absolutely no sense to do so when it isn’t necessary. And that brings me to my point. We do have a choice. I know people try all sorts of things in an attempt to be more comfortable. 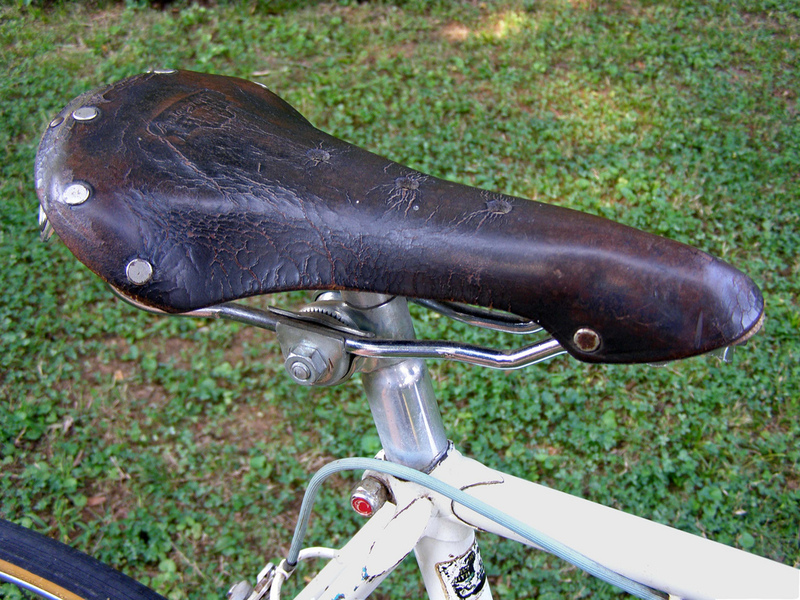 There are hundreds of bicycle seats available making various claims as to how much better one is over another. I have tried a few of them and still found them all uncomfortable. They make special clothing (very expensive, of course) for cyclists to aid them with comfort. Personally I think this is ridiculous and the wrong approach to the problem of discomfort. First of all there is nothing sacred about a diamond frame bike, but there sure seems to be with many cyclists. I don’t get it. Not only is there the serious problem of discomfort and serious physical damage to the body occurring over time, but there are other factors such as going down in wrecks and getting hurt or even killed. 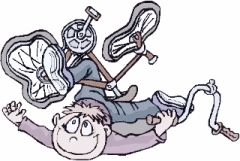 The fact that one is so vulnerable seated on a diamond frame bike is something to consider. 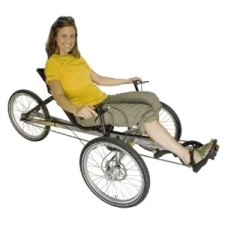 Recumbents are the answer and especially recumbent trikes since a recumbent bicycle can also go down. I know … been there … done that! Yep, riding a tadpole trike has so very many advantages. As far as I am concerned it is a “no brainer”. They are far more fun to ride. They are far safer to ride. 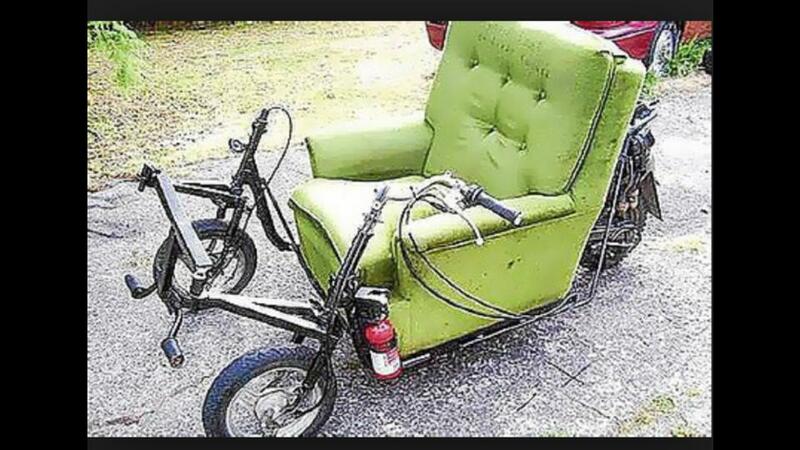 And they are far more comfortable … even more comfortable than a recumbent bicycle. Both are smiling but one is a cartoon. In the real world it is not likely the rider would be smiling under those circumstances. DON’T YA JUST HATE IT? Now I ask ya … don’t ya just hate it when the manufacturer makes changes which in your opinion take away from what they previously offered? Microsoft immediately comes to mind when this question is asked. I started using computers back with Windows 95. Of all the operating systems Microsoft has produced over the years the very best in design and function in my opinion was Windows 98. Other that the stability issue I thought it was by far the best. It makes absolutely no sense to me to create good practical features and take them away. It is even worse when replacing them with features that are not nearly as good as what they had before. As time went by I got more and more disappointed in Microsoft’s operating systems to where I don’t care to use any of them anymore. I switched to Linux and love it. But I am not here to discuss computers and operating systems. What I am here to talk about is tadpole trikes. I was just looking at Catrike’s new mesh seat. When I got my 2013 Catrike Trail frame under warranty last summer (my 2009 frame developed a crack alongside a weld) Catrike sent a new mesh seat along for it. Since the frame had changed to a folding type seat back they no longer used the original mesh seat like my 2009 model had. 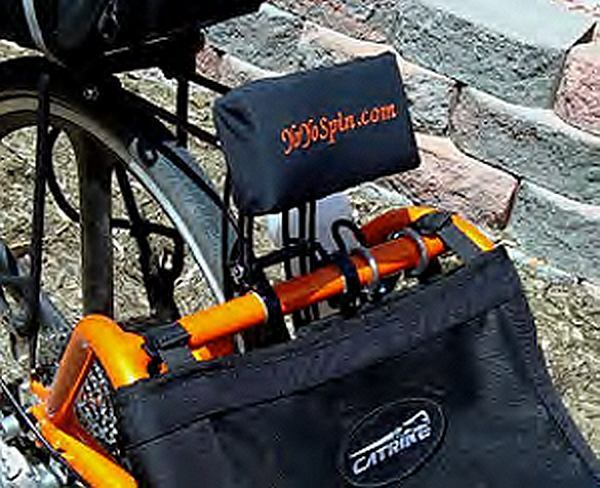 I tried using the new mesh seat but Catrike had removed the large “pocket” in the back of it which is where I keep my tools. I don’t know why they removed it as there certainly is no physical reason. There is room for it. Anyway, it didn’t take me long to remove their new mesh seat and put my old mesh seat on the 2013 frame. Now I have my large storage pocket back to use. And, yes, the old mesh seat works just fine on the folding seat frame. Of course, I don’t know what I am going to do if my old mesh seat ever wears out and requires replacement. I will have no choice but to put the newer one on since that is all Catrike offers. Needless to say, I am not a happy camper over this. ROADIES … BLESS THEIR HEARTS! Roadies …. Bless Their Hearts! I thought you might enjoy watching this video which pokes fun at roadies. 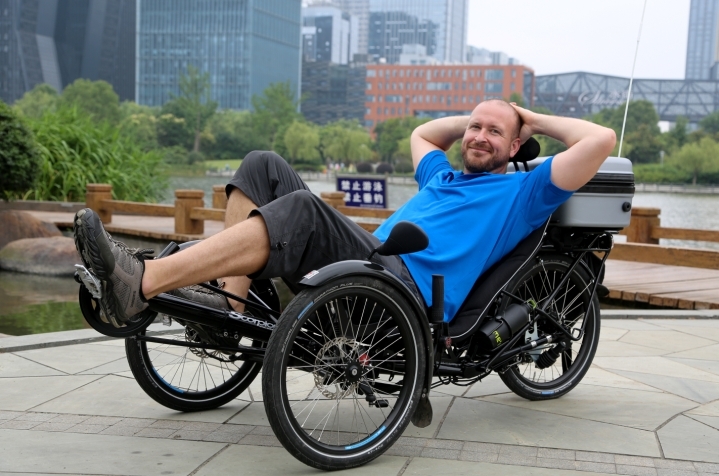 35 year old Matt Galat is beginning his epic adventure today … travelling around much of the world on his HP Velotecknik Scorpion fx 26 tadpole trike. 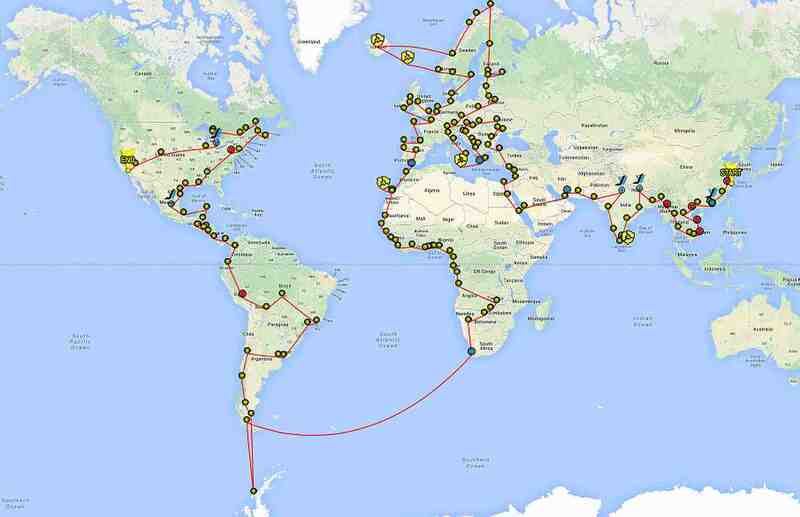 Over 100 countries … 50,000 miles … over 5 years … what an undertaking! It is some “bucket list” he is pursuing. During this adventure he plans on undertaking some other activities such as climbing Mt. Everest and hiking the Appalachian Trail. Just the enormity of planning and preparation of such a journey staggers my mind. Getting all the necessary visas, etc. needed to enter the various countries he plans on travelling thru would be challenging. Here is an online article about him. 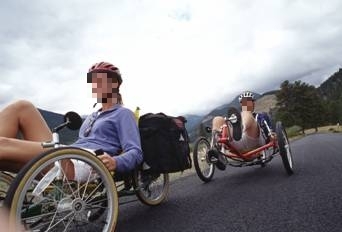 Leaning back in a recumbent seat means that in order to see forward the rider needs to hold his/her head up. Depending upon the angle of the seat back it becomes more challenging to hold one’s head up to see forward. Leaning back at a 25 degree angle like a Catrike 700 or ICE VTX most riders say that they like having a head/neck rest. Then there are those like myself that just like using a head/neck rest. And there are those like myself who need to use a head/neck rest. For instance I have arthritis in my neck and it helps me immensely to use a head/neck rest. I would be most miserable trying to ride without one. I have been saying “head/neck rest”. Perhaps I should try to explain further this terminology. A head rest is designed to offer support for the backside of one’s head. If the rider wears a helmet this may or may not present problems depending upon the design of the helmet and the height of the headrest. That is where a neck rest comes in. Manufacturers call what they provide a neck rest and not a head rest as they have to comply with the helmet laws when they manufacture a trike. A headrest can and often does complicate matters when helmets are involved. A neck rest eliminates this. That being said, in my opinion a neck rest in and of itself is not nearly as comfortable as a head rest. And without exception all of the neck rests trike manufacturers sell are quite uncomfortable … like leaning your neck back against a brick. I tried two of them Catrike offered before deciding to make my own. My homemade one I call a head/neck rest as it is large enough that both my head and my neck rest against it. And it is super soft and very comfortable. I don’t understand why trike manufacturers don’t and won’t offer something like what I made. It seems so ridiculous to me that theirs is so stiff (hard) and unforgiving. Here is a picture of my head/neck rest. These are most definitely a great improvement over what the manufacturers offers. I still prefer mine though as it is even more comfortable. 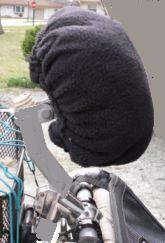 Mine is made out of 4 inch thick foam … considerably more than any other head/neck rests I have seen. A head or neck rest should be fully adjustable … in height, angle, and able to be moved forward or backwards. Not everyone likes or wants a head or neck rest positioned to where they use it full time. Some prefer to have it positioned back a little ways so that they can ride without being in contact with it unless they choose to do so by leaning their head back just a enough to make contact. You can check out what is available for various trikes HERE and HERE. So whether you like a head or neck rest or not is a personal choice. They are available. By the way, the ones that come from Krispy Steve are not only more comfortable, but they are less money than the ones that come from the trike manufacturers. Below is his current price list. ✔ All towers and side mount tubes come with end caps. ✔ Custom tube lengths are available for special applications. Not recommended for Catrikes unless you are 6’2″ and taller. I just had glaucoma surgery recently and so I thought I might write about riding with poor eyesight. I am not riding right now as I am not supposed to do much of anything for a week. And actually my eyesight is still quite good at this point in time so this doesn’t apply to me. However, I do know a couple of gals who ride tadpole trikes and this does apply to one of them. They always ride together and one is always following directly behind the other. They wear two way radios so they can talk to each other as they ride. The one following has poor vision and is dependent upon the one leading to help her “see” to be able to ride safely. She can see the trike directly ahead of her sufficiently but beyond that she needs help. The one leading is always instructing the one following as to what to do … turning, slowing, stopping, hazards to be aware of, etc. This system seems to work out well for them. They are both in their early 70s I think. One was in the army and the other one was in the navy. One flies an army flag on her trike and the other flies a navy flags on her trike. Every time I see them I have to admire them for this friendship and dedication on the part of the leader to help her friend. I don’t know of anyone else doing anything like this, but I am sure there are others. Of course, another option would be for both to be riding a tandem trike, but I am sure this gal enjoys the independence of riding her own trike. I know I would. Regardless of the matter of eyesight certainly riding together with others can be quite beneficial in more ways than one. First the more cyclists there are riding together the more visible they are to others … particularly motorists who need all the help they can get in seeing us. Secondly we can help look out for each other by sharing important information such as “car ahead, car behind, car right, car left” or “bike back, bike up, bike right, bike left” or ” walker up” or “runner up” … well you get the picture. If you know of others with such vision impairments who have a means worked out where they are able to ride please feel free to comment and share it here. I am envious. I have one other tadpole trike rider I ride with. We can’t seem to get anyone else to get together to ride. Some say they will but we never see it materialize. Most tadpole trikes I am aware of come with Presta rim/tube valves. My Catrike did and it didn’t take me long to do something about it as I readily admit that I don’t like Presta valves. That being said, you, the reader, know where I stand. I know there are many who do like them even if I fail to understand why. 🙂 I personally think they are nothing but a pain in the neck to use in comparison to the simplicity and practicalness of a Schrader valve. I will start this off with a video which illustrates and explains these two different types of valves as well as air pumps and adapters for the Presta valves. If you like Presta valves and want to continue using them then the remainder of this article isn’t for you. But if you are like me (and many others) and would prefer Schrader valves you can do something about it … and I am not talking about buying new rims which would be very expensive and quite unnecessary. 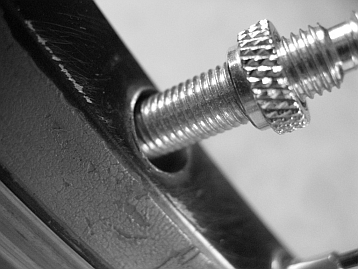 Unless one has a very narrow rim and tire it is not necessary to use the Presta valve. 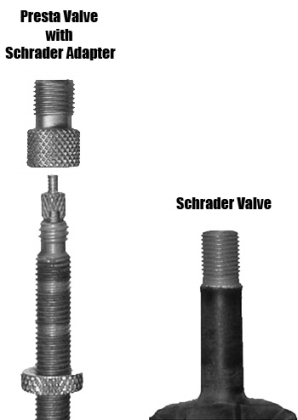 Anyone wishing to switch to a Schrader valve can do so easily by drilling out the hole in the rim to a larger size diameter. Some say use a 3/8 inch drill bit but that is a bit oversize. I use a 21/64th inch drill bit. Be careful when drilling the rim as you want to end up with a nice round smooth hole. Most definitely you don’t want the drill bit to “grab” as this can mess the hole/rim up. If you are having problems breaking thru once you are most of the way thru you can try running the drill motor in reverse. This usually works well without dealing with the grabbing problem. Remove any burrs. Also remove any and all shavings including any trapped inside of a double walled rim. Here is a simple and handy tip on how to inflate a Presta valve using a Schrader pump when you don’t have the adapter to use … (hint: you make an adapter out of the Presta dust cap). 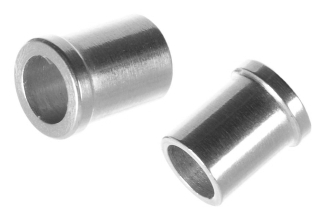 If ever you find that you want to or need to go back to a Presta valve after drilling out the hole in the rim you can purchase a bushing made to go in the larger diameter hole so that the inside diameter is the correct size for the Presta valve. Here are pictures of what are probably the most common type. As you can see one goes into the hole of the rim while the other one is threaded and goes on the Presta valve threaded shaft and down into the bushing in the rim. There are also simple bushings which just go in the hole and the shaft of the Presta valve goes thru it without such a threaded nut to hold it in place. I don’t profess to know much about them. I used one once. 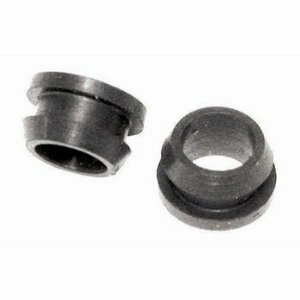 These longer bushings are designed to go thru a double wall rim which most tadpole trike have due to the needed extra strength they provide to handle the tremendous side stresses placed on them when cornering. I hope this is helpful information for some folks. Questions and comments are welcome. Sooner or later it happens … the chain wears out and needs to be replaced. On a bicycle this happens much sooner mileage wise than it does on a tadpole trike. That is good news for the tadpole trike owner, but wait … there is bad news as well. The bad news is that a tadpole trike takes 2 to 3 times as much chain as a bicycle. Yeah, that’s bad news, but wait … there is good news in the midst of this. Because the chain is much longer it takes longer to wear out. 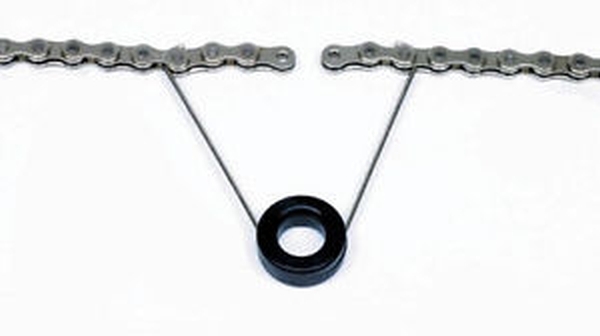 “They” recommend replacing the chain on a bicycle every 2000 to 5000 miles. That is quite a variance, but the actual wear is dependent upon various factors such as rider weight, riding style, amount of shifting between gears, how the chain is maintained as far as lubrication and cleaning, etc. I have never read anything about how long a chain of a tadpole trike should last, but I got about 9,400 miles out of my first chain. I just recently replaced it again and this time I got about 12,400 miles out of it. I admit though that it was over due. There is danger and concern in continuing to run a chain which is worn out. 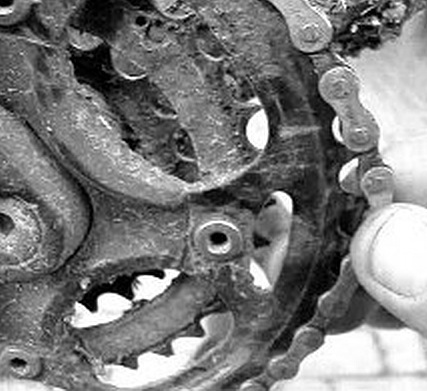 A worn chain will wear out the sprockets prematurely. Normally the ratio between sprockets and chain replacement is 2:1. That is, you will go thru two chains before needing to replace the sprockets. And as far as sprocket replacement is concerned it may not be necessary to replace all the sprockets on the front if you don’t use one or more of them much. 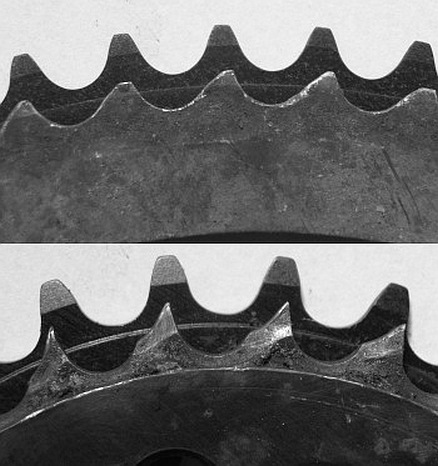 Many people just pretty much stay in the center chain ring (sprocket) so the smallest and largest sprockets may not need replacement when the middle one does. The rear sprockets (cassette) is sold as a set of sprockets normally so you most likely would have to replace all of them even if some aren’t worn much. By the way, I am talking about a machine with multiple sprockets front and back. If you have a different setup than this not all of this will apply. Chains stretch as they wear and grow in length. Actually they don’t really stretch but we say they do. The side plates of the chain don’t change in length. What happens is that the metal wears off in the pins and rollers allowing the chain to become longer so we say it stretches. In the image above you can see worn pins vs. new pins. When a chain stretches it will wear the teeth of the sprockets quicker as it no longer “fits” them properly. One quick test to determine chain wear is how it “fits” on the sprockets. It should be a snug fit and not able to move around much at all. 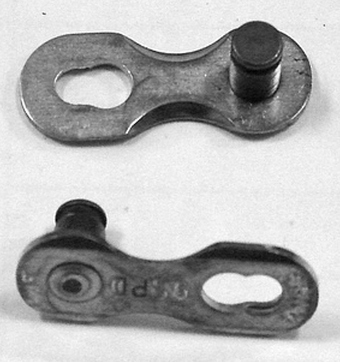 Below is an image of a sprocket illustrating a worn chain. You can see how the chain no longer fits and can be easily pulled up off of the sprocket and moved about. 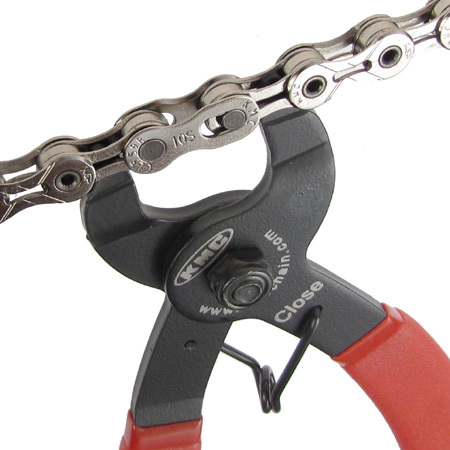 Standard bicycle chains measure one inch between the pins of the side plates of the chain. This is called the pitch of the chain. They make tools to measure chain wear, but you really don’t need one. 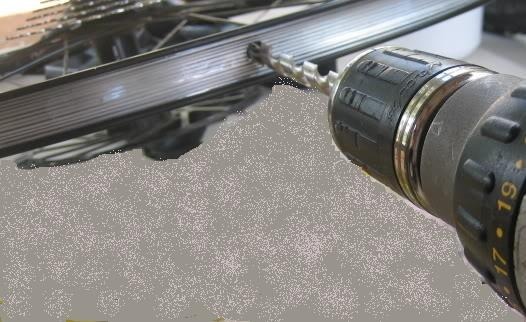 All that is needed is to take a measurement between pins with the chain “stretched” tight so that all worn parts are as far apart as they will go and displaying whatever elongation has occurred. Place a tape measure or ruler on a pin and go 12 inches out onto the pin at that link. A new chain without any wear should measure exactly twelve inches. A worn chain will be longer. Anything more than a 1/16 of an inch past the 12 inch mark is worn too much and should be replaced. In the image above you can see that the elongation is more than a 1/16. 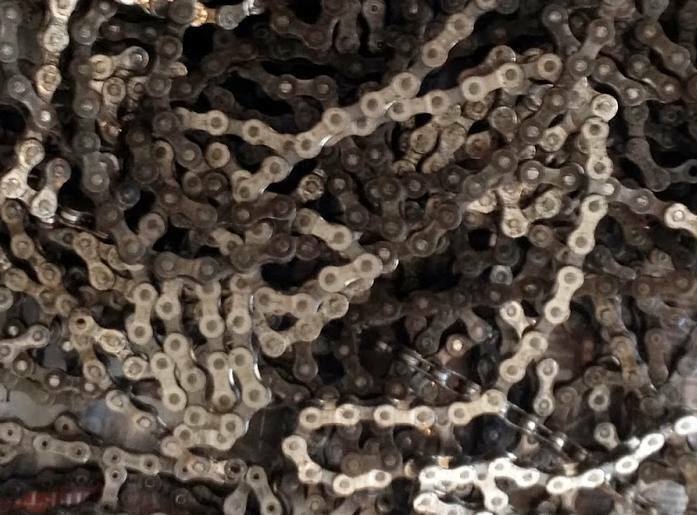 For counting purposes to determine the length of the replacement chain I personally think it is easiest to count each section shown as “pitch”. You can do what you want but just don’t get “corn-fused”. 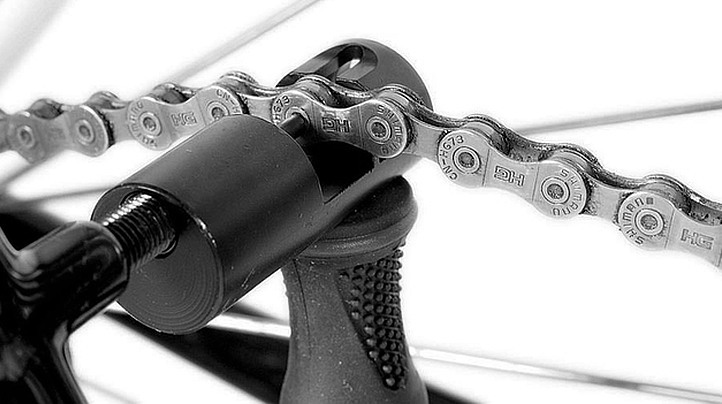 Determining whether or not the chain is the correct length is a matter of shifting between the various gear combinations. One needs to be careful when doing this as damage can be done if the chain is too short (which mine was). When you attempt shifting the chain onto the largest sprockets front and back you can run into big time trouble if the chain is too short. There are those who say you should never use this combination nor the combination of smallest in front to smallest in back. This is called “cross chaining” and many years ago this was a serious matter. With today’s chains it is no longer a concern. Also on a tadpole trike it really isn’t a concern anyway since the chain is so much longer than on a bicycle. It doesn’t really make much sense to use these gear combinations but if you do you system should handle it as long as everything is adjusted properly and the chain length is correct. One thing I want to mention is that when adding or removing links in a chain and putting the chain back together using a chain breaking tool you need to be careful to push the pins back thru stopping in the right place … equally centered in both inside and outside plates. You may need to push the pin back from the opposite direction if it goes too far. If you fail to do this you might find yourself sitting alongside the road/trail with the chain “broken” at that link. I know this from personal experience. I carry a chain breaking tool and several inches of spare chain and master links so I can make a roadside repair if needed, but not everyone does. So be aware that this will leave you in a bad way if it happens to you. Also, when adding or removing links in a chain you should check the chain at that link to be sure it moves freely and is not bound up. If it is too tight I recommend simply taking the chain holding and flexing it sideways from one side to the other to loosen up that pin in the link. The final thing I want to mention concerning adding or removing links is that one needs to be careful when pushing a pin thru the side plates. It is important to get a “feel” for doing this as well as visually determining how far to push it. If you go too far and the pin comes all the way out of the far outside plate it makes it quite difficult to reassemble the chain as those pins are difficult to get back in place. If one does come out I usually use a pair of needle nose pliers to squeeze it back into the hole. I have found this to be about as easy of a way to accomplish it as anything I have tried. Just be sure the pin is going in straight. The connecting link most common nowadays are called “missing link”. 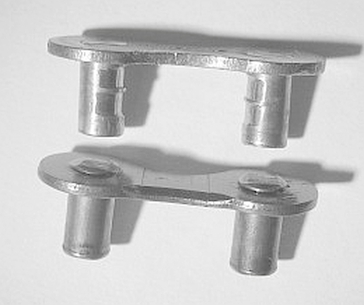 They are quick and easy to use to put the chain together, but when it comes to taking these connecting links back apart they can be a nightmare. I have struggled long and hard dealing with them. Personally I much prefer the old type master links with the retaining side clips, but they can no longer be used in today’s multiple speed sprockets. They make a special plier tool for this purpose. I modified a pair of pliers I already had, but I still find these links hard and frustrating to take back apart. It makes working on a chain so much easier and less frustrating. It is maddening to have your chain routed thru tubing, around sprockets, derailleurs and pulled together trying to put the connecting link in it when suddenly you lose one end of the chain and it takes off in retreat undoing all your hard work routing it. This tool will prevent this. You can make your own but these are not all that expensive and well worth buying. I hope this helps others in knowing about chain and sprocket wear and replacement.